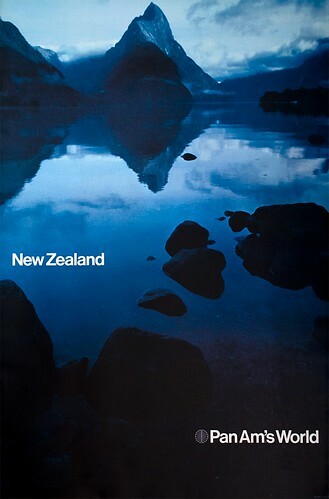 New Zealand, originally uploaded by eyemagazine. This series of Pan Am posters from the 70s brings so many things to mind. First: I want to go to there. Secondly, the obvious power of evocative photography. Thirdly, the obvious modernity of Helvetica. Fourthly, the wonderful grace of a restrained design and lastly, the 70s weren't all bad. Sometimes, I'll see a building or a graphic from the era of my youth and say how great it is, how "70s" it is and then qualify that with "good seventies" because so much of what was popular or common in 70s design was really awful. I'm sure as designers reach back for inspiration we'll find ourselves saying things like, "good 80s/90s" etc. Though there has been plenty of fine design in this past decade it's just hard to say the "aughts" without air quotes and explanatory mumbling. For more information on these posters see an article from 2009 on the Eye Magazine blog. My apologies to all good English teachers for not being consistent with my use of "70s" or "Seventies". I generally follow Strunk and White but I don't have a copy handy to refer to at the moment of this writing. Another apology to all semantic HTML Web designers for my egregious and wanton use of the SPAN tag. I Love This. I Hate This.